For Control Techniques servo motor repair, TigerTek is the partner of choice for facilities across the nation. Our technicians are factory trained and certified, with hundreds of hours logged on repairing Control Techniques servo motors. Our 30,000 sq ft dedicated repair facility includes a large inventory of OEM parts to ensure quality and speed. In conjunction with our in-house machine shop, motor shop, and electronics laboratory, all repairs for Control Techniques servos can be handled entirely by TigerTek - never outsourced to other locations. This is a vital piece of our reputation for speed and quality - since your motor remains in our facility throughout the repair process, we can deliver a turnaround time virtually unmatched by other repair shops. Additionally, this streamlines our multi-point quality control process, ensuring that all servos are returned to factory specifications beforing being run-tested and returned with a detailed failure report. Although it is rarely needed, all Control Techniques servo repairs include a 12 month warranty for your peace of mind. 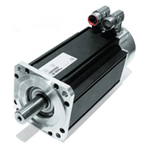 Reduce downtime, save money, and send your Control Techniques motor to the servo repair experts at TigerTek! Contact TigerTek today.